Happiness decreases at a daily rate of 10%, the same as hunger, and only starts negatively affecting dinosaurs if it sits at 0% and remains there. Unfortunately, depressed dinosaurs like that will start doing self-destructive things like plucking their own feathers or scales, and will start losing 10% health daily. Luckily, playing with an enrichment item boosts them straight back up to 100%! I'll be bug smooshing tomorrow and adding in some more new page designs. Also, give a ton of love to the mods, who are currently working on some helpful descriptions for the upcoming item library! This month's monthly donation item is the Herbivore Hammer, which can cull an entire herd at once for meat. * The "more information" tab for overlays has been removed, after the button was found to be covering a few species' faces! * The "quick battle" sidebar has reappeared on dinosaur pages for fast healing and level/EXP checking. Alongside this, Xylax has revamped a batch of food items for us! It's our mod's birthday today - happy birthday Zani! To celebrate, pickup one of the Zani Plushie Piles from the collectables store today only! If anyone missed their last breeding on their dinosaurs yesterday/today and the dinosaurs aged to 81, let me know the ids and I'll reset their ages back so you can breed them once more. Unfortunately, due to time restraints, our mod Kitei has had to step down. <3 She will however still be around on EX, doing art and hanging out on the boards! Taking her place are our two fledgling moderators who have now graduated to full modship - Spotty and Sammei! Yaaaaay! There's a dinosaur page revamp currently in the game and I hope you guys all like it. There are also fancy next and previous buttons which I know have been asked for since the beginning of time. I expect bugs with this, so please be sure to report any on the boards if you see them. 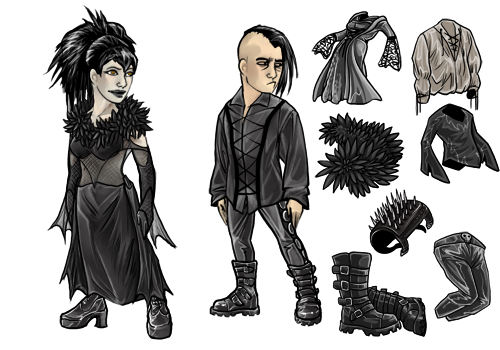 We have a goth invasion of fashion here at Exhibited, as we celebrate the first of our official avatar clothing/hair releases! Big props to Xylax who drew all of these. The next update should hopefully be a new dinosaur page design, along with a slight care change involving enrichment items and happiness. That's right, it's the first of the month! And we have some additions. The new donation item for this month is the set of Dodo Eggs. You can use these to hatch a little flock of Dodos to raise as prey for your carnivores (or just for fun!). I think you'll agree that they are very cute. Also! We have trading cards! Booster packs contain three cards. You can access your current deck of cards from either map 3 or by clicking the link on your profile. You'll notice there are different categories for each card, and they are numbered 6-10. 10 numbered cards are the rarest to find. As a note, I recommend doing a CTRL F5 (hard refresh) on your browser from the map page to be sure you're viewing the latest page. Quickie update today before I release trading cards!